A couple of months ago PTV released a set of three technical documents related to the Metro rail tunnel. I’ve done some skimming through two of them so far (I hope to read the third soon), and am posting some notes from the first one here that I hope might be of interest to people: the MM1 Concept of operations document (draft paper) from March 2011. I’ve tried to make sense of the material — some of it is somewhat jargon-laiden. If anything catches your eye, you should go to the source document, in case I’ve misread/misinterpreted/editorialised — or leave a comment below, and I’ll take another look and try to clarify, and/or try and find out from a contact on the project team. A little bit of jargon I’ve left in: MM = the Melbourne Metro tunnel. Originally it was thought it would be built in two stages. MM1 was the proposed first stage, Footscray to Domain; MM2 was the proposed second stage, Domain to Caulfield. The current thinking is for one project with a shorter total length than the original concept: Footscray to South Yarra, but some of the document refers to MM1 and MM2 as separate subprojects. The reason I find this specific document of interest is it gives a glimpse of what the planners have in mind for operating the train network 10-20 years in the future. 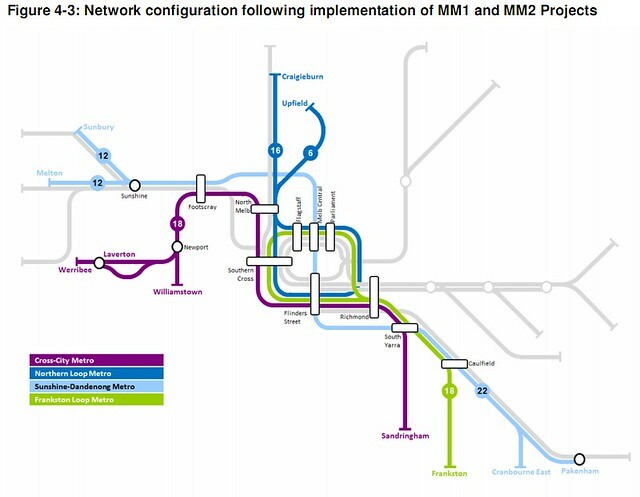 It’s different from the possible 2021 timetable in the Rowville documents because it’s got more detail, appears to be more ambitious, and obviously because it assumes a network that includes the tunnel (though it gives an indication of what’s planned even without it). Parts of the document talk about what the project is, and why the Department of Transport believes it’s important. In the excerpts and notes below, I’ve concentrated more on how they intend to use the infrastructure — eg what services they would run. Note that it concentrates purely on the lines to the north/west and the south/east, as those are the ones predicted to be subject to strongest patronage growth, and linked to/affected by the proposed tunnel. So then, notes from my skimming, with page numbers. p6 – a specific objective of “turn up and go” services “all day every day”. In other words: throw away the timetable. It’s very good to see this in here; recognition of what a big city needs for its rail system. p6 – sectorisation of Northern group into 3 sectors: Newport (eg Williamstown/Werribee), Sunshine (Sunbury and eventually Melton), and Craigieburn/Upfield. p6 – aim for longer (9-car) trains on Dandenong corridor, which I guess means Sunshine corridor too if they’re connected. MM1. Talks about this being the enabler for electrification to Melton. p11 – 38 X’trapolis trains, then 32 “Next Generation Trains (NGT)/Xtrapolis” to replace Hitachis and run in paths created by RRL. What’s actually happened so far is 7 extra X’trapolis trains got funded. In the 2010 election, the Coalition promised another 33 beyond 2014, but they’re not funded yet. The wording here seems unclear if they’d go for a new design or more X’Trapolises. p11 – Projects in p9-11 (eg RRL and the other stuff that’s pretty much already happening) helps meet projected demand until 2018.
p12 – has a nice diagram (above) of operations up to and including Regional Rail Link, and summarises operations at present (and pre-tunnel) in peak, notes these changes represent a 40% increase in Northern group capacity. Includes 13 trains per hour (tph) from Sunbury, 13 from Newport (eg Werribee, Williamstown, Laverton), 12 tph from Craigieburn (7 of these running direct to Southern Cross and Flinders St) and 4 tph from Upfield. p14-17 – Summary of demand vs supply on the Northern group. 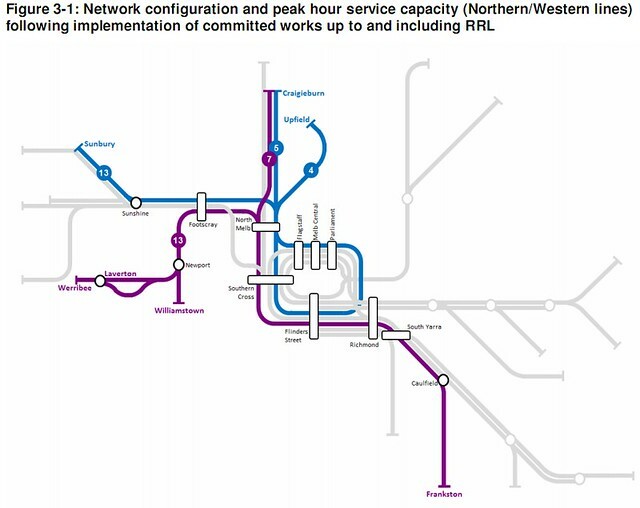 Newport lines forecast to exceed supply after 2015, Craigieburn after 2016, Upfield after 2016, Sunshine after 2014.
p21 – summarises peak hour capacity again, but compares 2010 vs post-RRL vs what the metro tunnel implementation would provide. p22 – talks about current planning (well, as of 2011) vs the Victorian Transport Plan in 2008. Of particular note is a change in priority regarding the need for extra tracks outbound from Caulfield, in part by introducing longer trains. p30 – Talks about platform and stabling extensions, and power and signalling changes to allow 9-car (232 metre) trains on the Sunshine to Dandenong via tunnel corridor. Initially extension would be to 7-car trains, then 8-9 later. p31-32 – Service plan (timetable) design principles. “A metro service should offer all passengers a train at least every 10 minutes at peak times”. Aiming for seats for all passengers making trips of more than 25 mins to the CBD cordon. Recovery time of 6% of total trip time. Some interaction with RRL, including RRL single track lines (in other words, Bendigo and Ballarat). p34-38 – Service plan for the Cross-City group (Werribee and Williamstown to Frankston and Sandringham) if MM1 is built. This also applies to MM2, however as noted on p49, Frankston would be moved into the Loop, and Sandringham would be the line through-routed to Werribee and Williamstown. p34 – graph showing paths into Flinders Street from the Werribee and Williamstown lines. I think I need to sit down with a bottle of wine and a few hours to spare to fully understand this. p36-37 – number of trains needed, and it also notes the change to the number of train kilometres: about double. p38-43 – Service plan for the Northern Loop (which would be the Upfield and Craigieburn lines). This wouldn’t change with MM2. Basically these lines would run at least every 10 minutes from morning to 10pm, and every 15 minutes outside those times. However at times of 10 minute services, every second Upfield train would start/end at Gowrie to get around the single track problem there. Hey, maybe they should just duplicate it?? p43-48 – Service plan for the Metro tunnel group (Sunbury and Melton to Domain). This section doesn’t really apply anymore, since MM2 would link it to Dandenong. See later. p49-53 is the plan for the full tunnel (MM1 and MM2), which is how it’s now planned the tunnel would be staged. p51 – the peak service pattern for the Metro tunnel (including Melton electrification) would be 8 tph between Sunbury and Cranbourne, and 8 tph between Melton and Pakenham (hey Deer Park/Ardeer would finally get a decent service), plus 4tph Rockbank to Pakenham, 6tph Sydenham to Westall (or some to Dandenong). p52-53 has those wacky graphs again, this time in both directions. The document doesn’t yet have details of off-peak service patterns, but presumably it’s planned to be 10 minute services for the most part, in line with the stuff on page 46 under MM1. p55-56 Fleet impacts, including stabling and numbers of trains needed: looking at 244 trains in total. p57-58 V/Line and freight impacts from Metro services. Hmm, paths to/from Seymour every 22 minutes? I guess they’re used to messy timetables. p59- Details of the reliability modelling they’ve done: aiming 90% or higher within 4:59 minutes for the affected groups. Overall this is interesting stuff. It’s of some comfort that this type of planning has been going on, and it’s good to see out, even if it’s somewhat indigestible in the form that it’s been published. And I’d note that many of the service improvements (in particular the off-peak boosts to cut waiting times) could be done whether or not the tunnel gets funded. It’s great to see some level of official recognition that planning for frequent trains all day, every day, is something that needs to happen — it’ll be important to get political backing for this as well, to ensure the funding is made available. Along with more frequent connecting buses, it’s critical to ensuring more Melburnians have a viable alternative to joining the traffic. And it’s cheaper and more effective than building new roads. ← Previous Previous post: Are mobile phones the new cigarettes? Next → Next post: Can you combine street art, classic video games and a Melbourne street map? Yes! Thanks. That took a bit longer than two minutes to write. I hope passenger predictions take into account that success breeds success. The better the system, the more people will be attracted to it. Don’t bother researching, but just if you know offhand, about how many platforms on the Dandenong line would need to be extended? Probably all of them I guess as there would not have been any reason to build them for anything longer than six carriages. Figure 4-3 shows the Melton and Sunbury lines each with 12tph but the Dandenong line with 22. I presume that it is a maths error not an intention to terminate in the MM? The platforms largely having been built for slightly longer trains, of 8 shorter cars (Swingdoor, Tait and Harris), could likely accommodate 7 car trains. The City Loop platforms are 3 metres shorter than a 7 car train would be, so 7-car trains could probably fit without much work. It looks like they would want to lengthen all the platforms on the Dandenong, Melton and Sunbury lines as they would seem to be planned to include the stopping all stations (except maybe Hawksburn-Malvern). I had a look through there, although I didn’t absorb quite as much detail as you. One thing I would be looking for, and didn’t see, is a map of the walk-up area at say 400m and 600m from Domain station, and whether that adequately covered the catchment area in that region. How would the proposed rail line to Doncaster enter the city region? Would such a line impact other lines – for example would it squeeze other lines out of the loop? I wonder if it should be tunnelled through the inner-north to join up to the new MM, thus giving people out east a very different alternative to entering the CBD. Perhaps it could even help people who wish to travel out north/west, thus bypassing the CBD altogether. People on the Belgrave/Lilydale who travel out west might make the journey (buses/car) to take the Doncaster line instead. @Andrew, I’m going to take a closer look at the other document that goes into patronage projections. Well yeah, its true, it is considered expensive to modify tunnels. On the other hand, if you study the history of the London Underground, there have been quite a lot of chopping and changing of routes, and abandoning parts of routes and then years later incorporating them into different new routes. So it does happen. I worked at a job where I had to copy text out of PDF version of the infamous Eddington Report from 2008. Those costings are from fantasy-land. Some of the things going ahead are out of order from the recommendations as you would expect. These things are not a secret, they are right there in the publicly accessible documents. The tunnel is going to take 10 years to build at least much like the City Loop tunnel that was started by the State Government when they didn’t actually know how they were going to pay for it. The Dandenong/Pakenham/Cranbourne line is at capacity and cannot expand much more. Also there is a surprise with the recommendation of permanently keeping tolls on Citylink/Eastlink as a revenue raiser. The capacity issues on the Pakenham/Cranbourne line are mainly beyond Caulfield where the level crossings and mixed operating patterns start. Re-signalling Richmond-Caulfield with 2 minute (or less) headways would also help. What is most needed to increase capacity is a level crossing abolition and track amplification project between Caulfield and Oakleigh. Great piece, Andrew. Mind-boggling complexities ahead. I’m working on an entirely heretical alternative in which I would like to incorporate even the vaguest idea how much the entire Metro project would cost. Have you heard any informed guesses by officials of any standing, or non-official professionals like engineers of how horriific the total might get to?